It's fishing season! Ranger Woodlore is stocking the lake, much to Humphrey's delight as he tries to intercept a meal intended for the anglers. I just took a vacation on the Disney Cruise Line. In the terminal before waiting time, they had several TVs all playing the same thing for multiple people. Among the many shorts, people seemed to get one of their biggest laughs from this one. I love Humphrey's stupidity, everytime Ranger Woodlore throws a fish in, he throws the armful of huge fish he had into the water to search for the other one, only to realize his mistake right after doing so. Humphrey is excited because Ranger Woodlore is stocking the lake with fish. Despite being warned to "fish like a bear" Humphrey keeps grabbing the fish as the Ranger dumps them into the lake. Of course, he drops all the fish he has, just to get one more. Humphrey spends so much time trying to get fish the "easy" way that time runs out on him, and he ends up being hunted. (It's now bear season.) Whoever animated the Humphrey character did a good job making him dumb, but lovable. I particularly like the wildly exaggerated expressions and movements that the animator gave Humphrey. He is a highly successful silent character. Sometimes I think that this type of character is Disney's greatest contribution to animated cartoons. (think Pluto) They are generally much funnier than the speaking characters. Maybe Humphrey could be the mascot for Disney's California Adventure. I enjoy this Humphrey cartoon quite a bit. Humphrey is out fishing in the lake with his bare hands, but does not have any luck catching any fish. He decides he needs to use fishing poles just like the other fishermen, but Ranger Woodlore demands he fish like a bear. The animation of this short is rather limited, but that is understandable as this cartoon was made in the late 50's when budgets in animation were beginning to shrink. Nonetheless, it is still a very funny short. I really enjoy the gag where the ranger is planting fish eggs in the hatchery and after watering them, they sprout like plants. Another gag I like is when the ranger throws the rainbow trout into the lake and a rainbow is produced while they are being thrown. I feel this is a great cartoon. This short is okay but the two parts with Humphrey throwing all the fish back in the lake gets boring after awhile. Also the theme opening to this short should ring a bell to the ear's of Disney video collector's (like me) as this theme would later be used as the opening to the Walt Disney cartoon classics released in the early 1980's. I love this cartoon and wish Disney would release it on DVD. I love Humphrey and remember him and the Ranger fondly from my childhood. Although I have to say that as much as I love Humphrey, I always preferred the Ranger. I loved his soft voice, and his the way he treated Humphrey. I wish they would make more Humphrey the Bear and Ranger cartoons. A hilarious short! I just love Humphrey's and Ranger Wooldore"s great sense of humor and it really made me laugh a lot. When I was around 10 or 11 in Hawaii, I still think about the short and mostly act it out all by myself. I give this short a 10 and it's highly recommended! This is one of my favorite Humphrey shorts; besides In The Bag. It has imaginable slapstick humor; a fish smacking Humphrey in the face with its tail while hilarious sound effects were added to provide comic relief, and Humphrey trying to catch as many fish as he can but keeps dropping the huge amount wrapped around his arms whenever noticing more. May I warn to all that own the Kids Klassics public domain tapes that have Hooked Bear on it contains a junky sound track, improper syncronation for fullscreen, and bad image quality, but you should expect that from a cheaply made video tape. Good job on the creation of this site, keep up the good work. This is the first cartoon in Disney's series of "Humphrey the Bear" shorts. 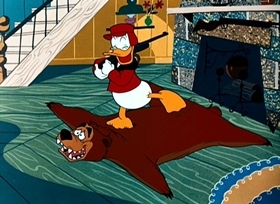 For those who are unfamilar with Humphrey the Bear, he was an antagonist of Donald Duck in the early 1950s. Humphrey spun off into his own series of shorts. The series was about the bear versus the park ranger, Ranger Woodlore. (The premeises are sort of similar to the Yogi Bear cartoons.) Hooked Bear and In the Bag are the only two cartoons in the Humphrey the Bear series. He wasn't animated since until his debut in Mickey Mouse Works. Hooked Bear is a lot of laughs. I especially like the "rainbow" trout gag and the punchline about fishing season turning into hunting season. This short is rare, but I recommend it.